Huge amounts of dredged marine sediments are generated periodically in order to maintain waterways and ensure ships navigation. After dredging, marine sediment are either discharged at sea or disposed in lands. Nowadays, dredged sediment reuse in civil engineering applications become more and more a beneficial tool for waste material management. Indeed, various reuse ways have been studied such as road construction, clays bricks, cementitious materials and paving blocks. Sediment characteristics are the primary decision maker in choosing the adequate valorization way. Thus, laboratory identification is an essential step in sediment management. Physical, mechanical, chemical, mineralogical and environmental properties of dredged marine sediments define the possible civil engineering applications according to standards. This works is divided into two main sections. In the first part, a literature review of sediment reuse is presented. The choice of alternative reuse is based on geotechnical, mechanical, chemical, mineralogical and environmental characterization of marine sediment. 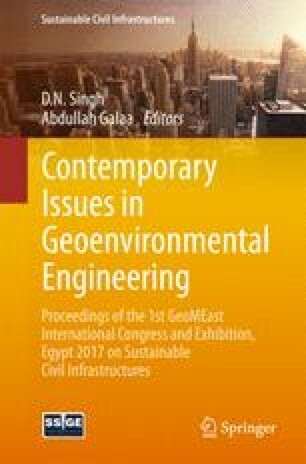 Possible sediment reuse in civil engineering applications are classified according to material proprieties. The second part, deals with two different applications of marine sediment dredged from two Tunisian harbors. Sediment extracted from the first study area, Zarzis commercial harbor, was reused as a new material for road construction. The mechanical tests of various formulations conducted on different mixtures are compaction and compression. The experimental results showed the feasibility of Zarzis sediment with 3% lime addition in road applications in base-course material. Sediment from Gabes harbor is the second investigated sample. Based on its characteristics, this material could be reused in concrete formulation. Results revealed that the substitution of 20% of sand volume by Gabes channel sediments provided a concrete with higher compression strength than reference one. This study was funded by the partnership Hubert Cruien “Utique” of the French Ministry of Foreign Affairs and the Tunisian Ministry of Higher Education and Scientific Research in Tunisia (Project No. 14 G 1116). The authors express their acknowledgements to the Tunisian Merchant Marine and Ports Office and the Tunis International Center for Environmental Technologies.